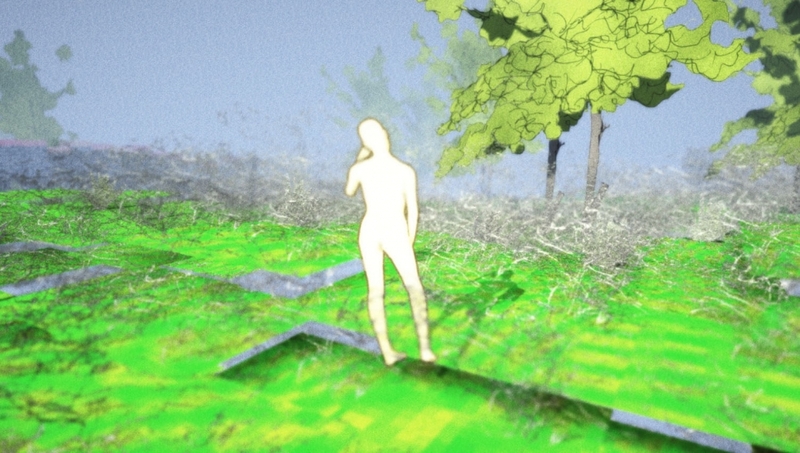 Game developer and new media artist Aaron Oldenburg presents a series of experimental interactive games in a solo exhibition at VisArts. Combining game theory, art theory, sound, and documentary processes, Oldenburg designs fictionalized game worlds that explore a variety of topics. Similar threads run through his work including imagery that revolves around finding the magic in the mundane, hybrid cultural experiences, overlaps between magic and technology, an obsession with physical but often seemingly empty spaces with powerful histories, colonies of outsiders, and a secular exploration of experiences of faith. Several of his games emphasize intuitive interactions and use obstacles and goals to provoke players to feel and reflect on the themes in his pieces. In other games, he takes real-life narratives and deconstructs them, turning them into generative narratives created by the player. He either allows players to cognitively build an exquisite corpse-style story about a real location, with multiple truths exposed by different characters, or simply to discover environmental narratives that build on one another throughout the course of the experience. The order of events changes the interpretation, as experiencing certain events directly influences the experience of subsequent events. The surprising and non-sequitur nature of this generative narrative approach makes non-player characters and environments seem more real. A former Peace Corps volunteer, Oldenburg is constantly looking for ways to move his process away from his computer and into interactions with real people. Thus, creating a short documentary in Guyana about those peripherally affected by the Peoples Temple massacre and the objects that left Jonestown sparked a motivation to combine documentary technique with game development. He has spent time with Guyanese ex-patriot bird racers in New York, witches and descendants of witches in Peruvian desert suburbs, and witnessed mundane absence and spiritual eccentricity at Pol Pot’s cremation site while collecting documentary materials for the creation of videogames. About the artist: Aaron Oldenburg is a game developer and new media artist whose primary interest is in game rules as an expressive medium. His video and interactive work has been exhibited in festivals and galleries in New York, Berlin, São Paulo and Los Angeles, including SIGGRAPH and FILE Electronic Language International Festival. He teaches game design as an Associate Professor in University of Baltimore’s Simulation and Digital Entertainment program and has an M.F.A from the University of Maryland, Baltimore County. In October 2003 he finished two years as an HIV Health Extension Agent for the Peace Corps in Mali, West Africa.